Polished charm indexes add signature flair at the mother-of-pearl dial on an elegant Swiss-made watch set on a supple, stainless steel mesh bracelet. 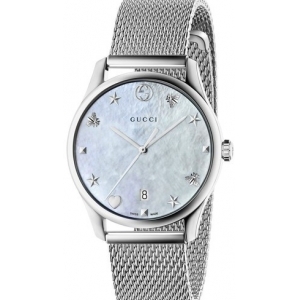 Style Name:Gucci G-Timeless Mesh Bracelet Watch, 36Mm. Style Number: 5457965. Available in stores.